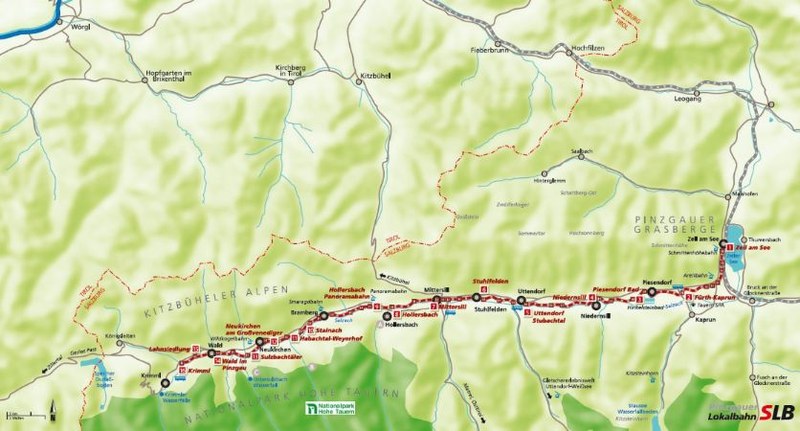 The narrow-gauge railway connects the towns of the upper Salzach valley, located at the edge of the largest protected area in the eastern Alps, for over 115 years. Many of the 40 stops are ideal starting points to natural and cultural heritages in the national park 'Hohe Tauern', in the Pinzgau Mountains or the Kitzbühel Alps. The modern trains travel the route of 53 km between Zell am See and Krimml (with the Krimml Waterfalls) hourly. With the Pinzgau Local Railway many destinations can be reached easliy. You can buy tickets on the train at no extra charge. Our traincrew will gladly invidse you. Zell am See is an elegant lake resort, situated in the heart of Austria. Experience the charm of the historic town center, the splendor of the spacious promenades along the lakeside and the stunning views of the nearby mountain peaks. Numerous top hotels offer warm hospitality and first class accommodation. Tip: Take a cruise on the lake! Take the narrow gauge railway to these spectacular natural highlights. The Salzachschauen area is one of the largest and most diverse natural preserves in Austria. Experience a vast array of different species in their Alpine habitat and enjoy some truly beautiful flora and fauna. Alternately you might fancy a visit to the Kitzsteinhorn glacier with its exhilarating ski trails in winter and extensive hiking trails in summer. Feel the energy of this special place in unspoiled nature. The panoramic walking trail starts in the village center of Priesendorf and along the way you will discover remnants of Celtic culture as well as several impressive standing stones, locally known as „Hinkelsteine“. In Priesendorf there is also a small fun park with water slides, swimming pools, a playground and other exciting attractions for the whole family. Bathing lake and Luzialacke nature reserve Summer holiday in the National Park region: by the idyllic bathing lake and directly next to the Luzialacke nature reserve. This beautiful Alpine lake will refresh your soul and senses! Take a swim in it during the peak season in summer or simply enjoy the beautiful setting during the other seasons of the year. There is also a nearby butterfly walking trail. In case you enjoy archery, you are bound to hit the bull’s eye by visiting Stuhlfelden. There are several indoor and outdoor archery courts and other excellent facilities for all those who pursue this sport. Mittersill is home to the modern visitor center of the Hohe Tauern National Park. It is the ideal starting point for exploring Austria’s largest national park. The local museum Klausnerhaus is a wonderful example of a historic Pinzgau farm house and is directly located in the village center. Visit the mineral collection at the Bramberg Museum and learn more about locally discovered emeralds. The Wollstadl show farm in Bramberg is also well worth a visit and features an excellent outlet for local arts and crafts. The Wildkogel is probably the most scenic mountain peak in the Pinzgau region and from its summit you will be treated to some of the best views in Austria. Take the gondola to the top and see for yourself. Experience the glamour and sparkle of the crystal baths in Wald. This wellness venue also offer a full range of year-round spa and leisure options. The Krimml waterfalls are amongst the largest and steepest in Europe. Enjoy this soaring natural spectacle and be sure to visit the attractively themed WasserWunderWelt info center as you make your way from the town center to the waterfalls.